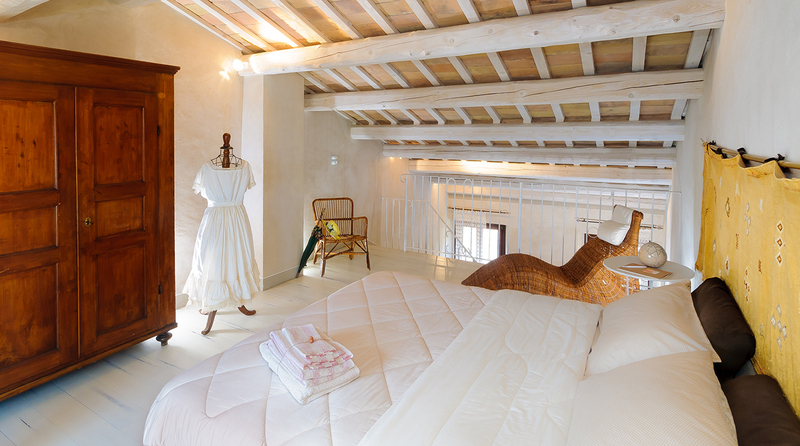 The Lindoro Suite is the ideal place for families and couples looking for a comfortable and refined holiday. 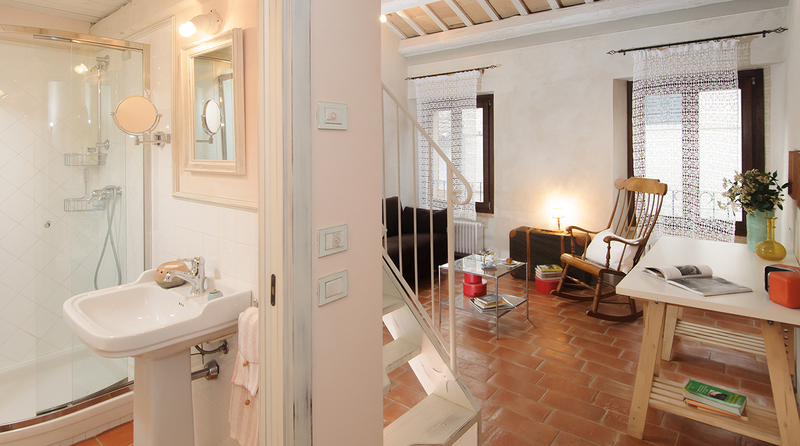 Our Suite Lindoro is on the second floor of the B&B Pomarancio. The room is named after one of the characters in Gioachino Rossini’s unforgettable opera The Barber of Seville. 20km away, in the beautiful city of Pesaro, the Rossini Opera Festival gathers connoisseurs and admirers of music and theater. Boutiques selling art and musical instruments line the streets of the historical center, all the way to its spectacular square overlooking the sea and surrounded by quaint Liberty houses. Here you will find the renown bronze sphere by sculptor Arnaldo Pomodoro, affectionately nicknamed Palla di Pomodoro (Tomato Ball) by the locals. The square is the perfect place for an original and elegant walk, in a space that feels like an open living room. This two-room apartment is a Rossinian crescendo: spaciousness, bright light and ease permeate the entire space. Large windows increase the room’s breadth and airiness, and the predominance of lighter tones brings out the darker shade of the furniture. A delicate staircase leads the way upstairs to the bedroom area on the loft. 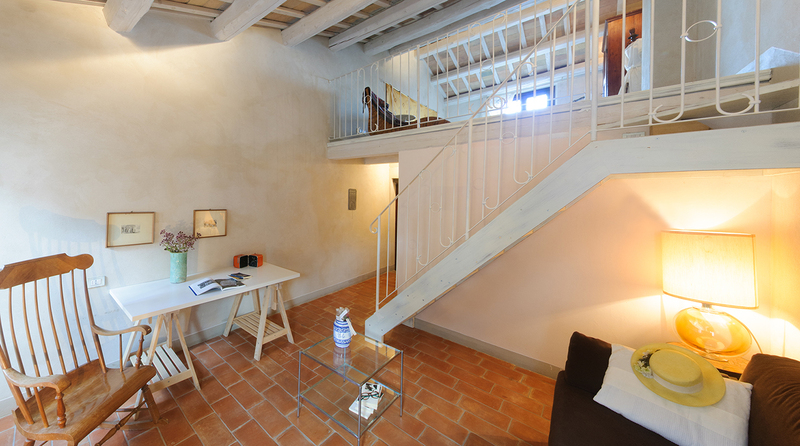 There is a spacious crawl space with white wooden beams and white parquet floors: here, from the window on the roof, you can admire the hills all the way to the sea, from Rimini to Pesaro. The hand embroidered floral curtain filters the light and makes the space more intimate and evocative. 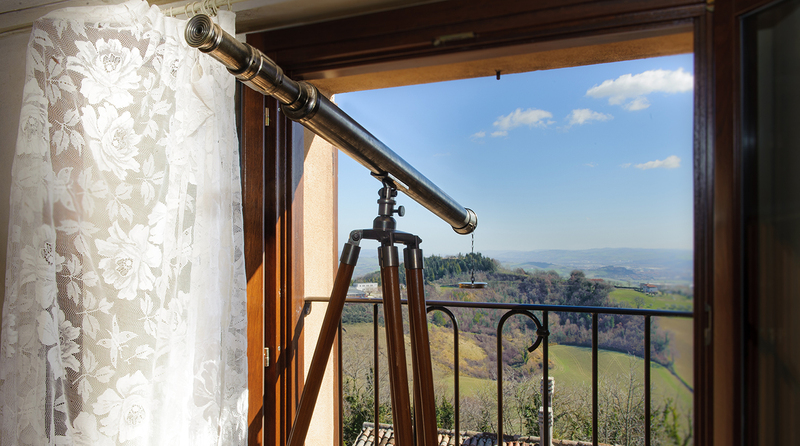 Next to the window, a Galilean telescope allows us to admire the details in the surrounding landscape, as we bask in the fragrant sea breeze. 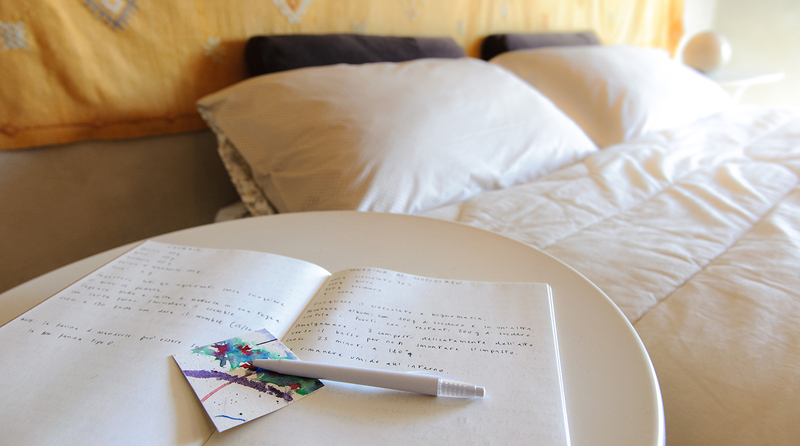 The comfort and elegance of a stay in a bed and breakfast near San Marino. 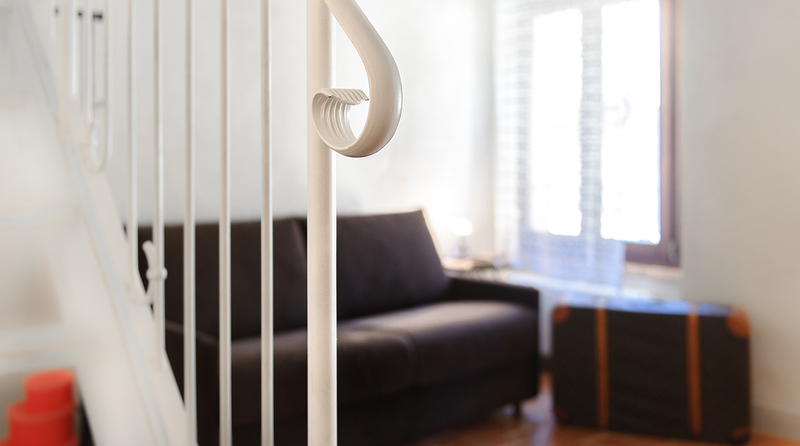 The railing of the loft overlooks the first floor: the two environments are subtly connected, without intruding on each other. 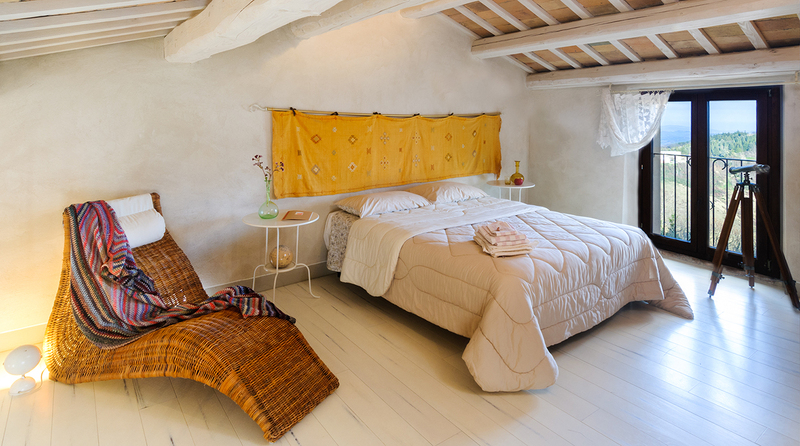 The headboard of the bed in ochre colored Kilim silk, and the loft’s slanted ceiling with white wooden beams, give the space an exotic and refined touch. The garden chaise longue almost seems to break the barrier between inside and outside: an oxymoron inspired by this beautiful landscape. 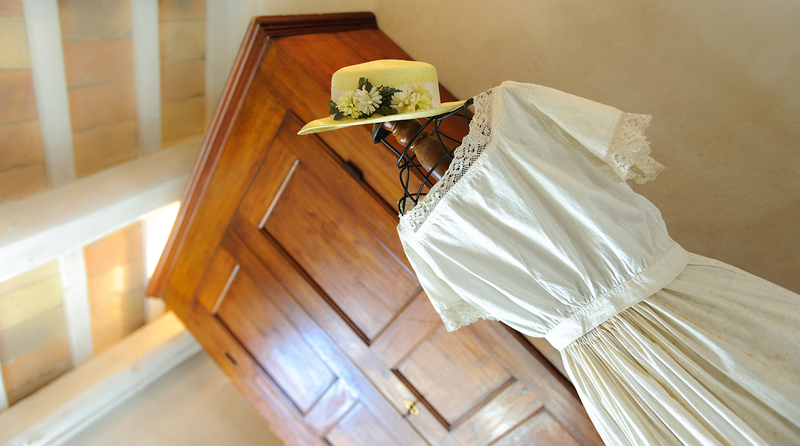 In front of the bed, the top of the crawl space frames the beautiful wooden wardrobe from the late 19th century, next to which a sartorial doll is always dressed in different vintage clothing, depending on the season and occasion. The first floor is equipped with a comfortable sofa bed, as well as a large desk and a rocking chair from the 1940s, perfect for reading the many books and guidebooks that fill the room. We also offer complimentary Wi-Fi. Hand embroidered curtains filter the sunlight: this is the brightest room in our bed and breakfast. The view towards the west allows us to admire the beautiful buildings in via Roma and the baroque bell tower of the church of San Michele, as well as San Marino and Mount Carpegna. The floor is in handmade cotto tiles, to mirror the room’s beautiful 17th century staircase, which is also made with cotto tiles and wrought iron. You will find Bellora linens and embroidery in the private bathroom, which is also equipped with a hairdryer and organic soaps. Every day, in addition to cleaning your room, we will leave small sweet and savory homemade snacks, seasonal fruit from the local orchards, and a selection of tea or a glass of select wine from one of the many wine growers in the area. 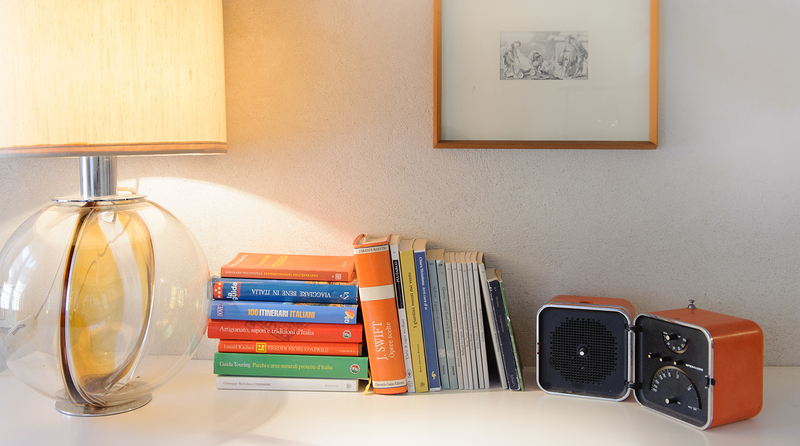 Do you like to have breakfast in your room? We will bring cookies, cakes and homemade jams, accompanied by homemade bread and much more, to satisfy all your desires!